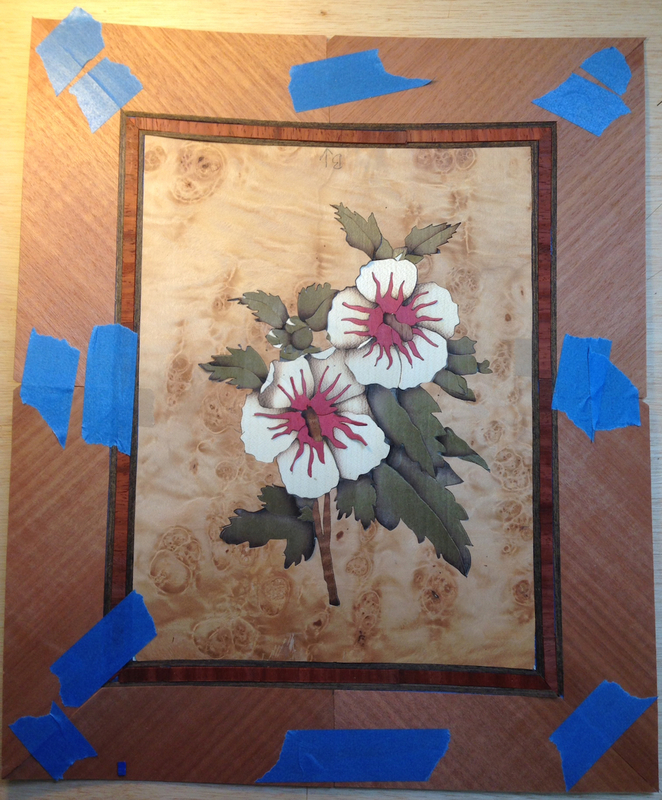 I snuck out to the shop for a bit today and filled in the rest of the details on my little marquetry picture. There are problem spots, but I’m not going to sweat it. I think the overall effect will be nice, and I’m not going to make myself crazy over it. (I’m trying to convince myself here, not you!). So, two goals. Fill in the missing pieces, and add a border. The missing pieces was maybe three steps. First sorting through a big pile of “extra” parts. Six layers of veneer, plus two backer boards, I’m only using one piece out of each layer, so there are 5 pieces in miscellaneous veneer left. This is the main reason for wanting to learn piece-by-piece, less waste. More sawing though. Once I’d found each part I had to sand shade, and then came the hard part. I’d lost several tiny parts, so I had to re-make them. There were also some details in the picture that I couldn’t say out because I was sure I’d lose them. So I cut all of this out of scrap bits. For example, this area had uncut details, pretty boring visually. This area was supossed to have green buds that had a hint of white flower petal showing through as they were starting to open. Too small to saw out (for ME to saw out), so I sawed out the buds, then knifed the green and white bud parts to make what I wanted. After cutting out some pie-wedges from the green and filling in with white, and doing a little sand shading, it looks a lot more interesting visually. This area is done, details added to the buds. The other thing I wanted to do was try adding a border. 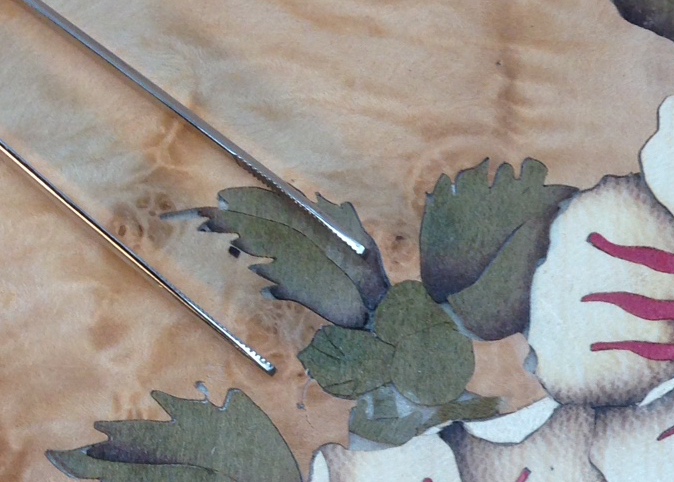 I recently bought a pair of DVDs on Marquetry and Veneering by Paul Schurch. 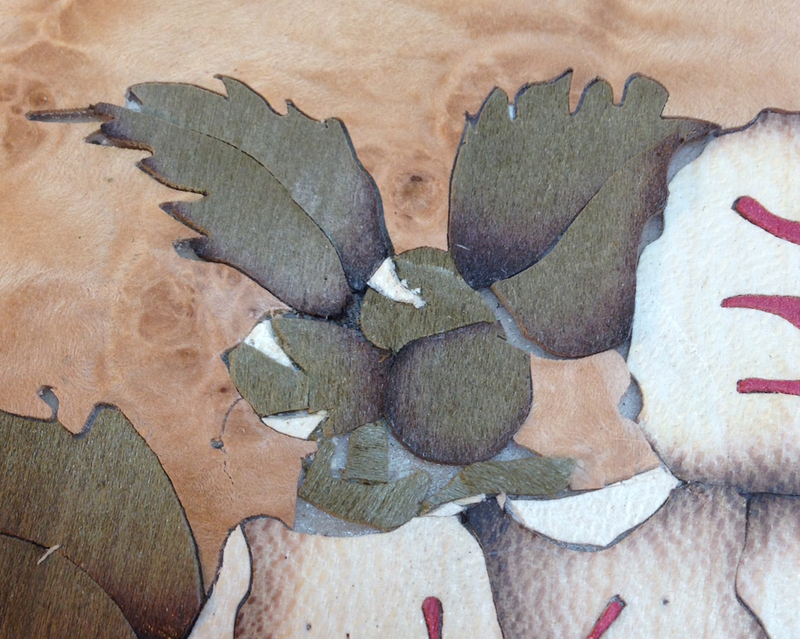 I wanted to see how his approach to marquetry worked, and I wanted to see if I could pick up any general veneer tricks. On his approach to marquetry, it’s very similar to what Patrick Edwards teaches, but I don’t like Paul’s approach as well. There was a lot of good info in the videos, and the technique for the border comes right from there. 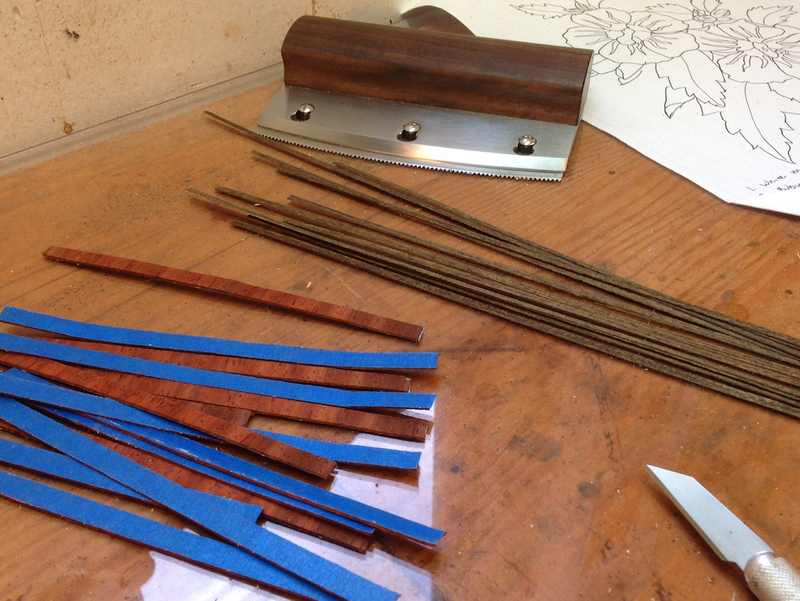 First I made a “filletti tool”, which is a fancy name for a strip of wood with a spacer on it. With this an a straightedge and a veneer saw you can cut any width of banding. Slide the veneer against the spacer block, the veneer goes under the spacer and against the body of the tool. Slide a straightedge against the tool and remove it. Now cut the strip that protrudes. 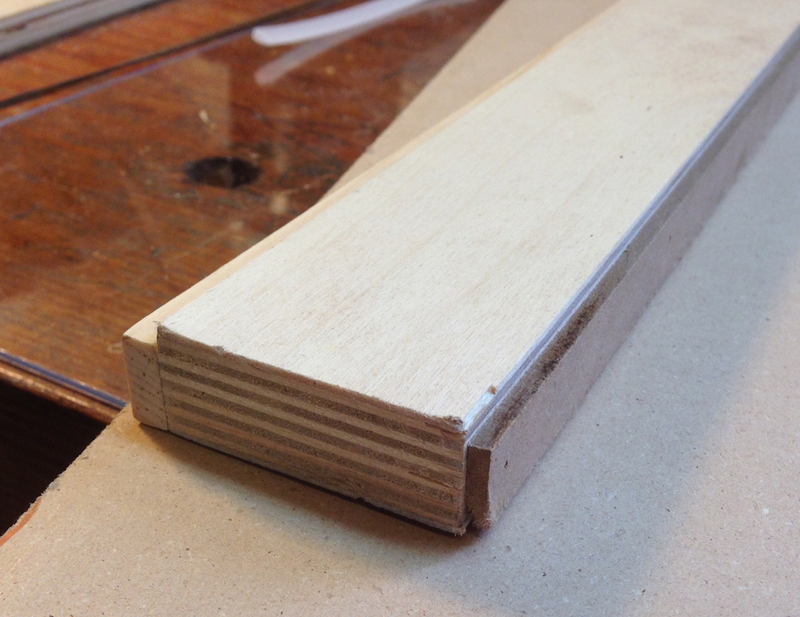 Fillette Tool, just a strip of plywood with a 1.8″ and 1/4″ spacer on opposite sides. Slide the veneer under the tool’s spacer, then put the straightedge against the tool, and remove the filletti tool. Next saw off the strip of veneer that is sticking out. Here is the result, a perfect 1/8″ of veneer sticking out. 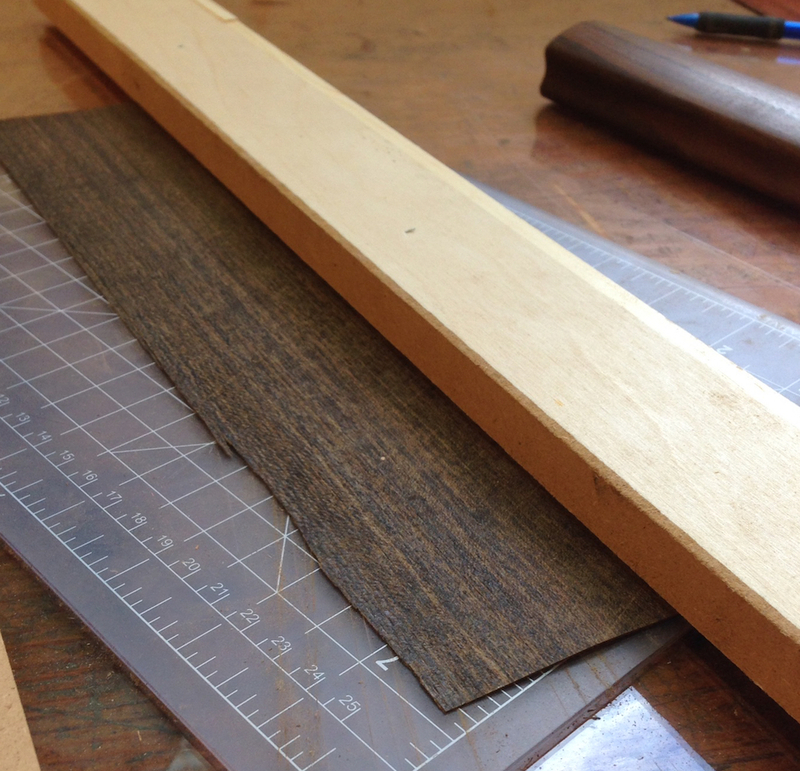 I made enough 1/8″ banding for two strips around the picture from a tiny piece of Wenge. I made a strip of crossgrain Padauk banding too. Banding with Wenge, then cross-grain Padauk, then Wenge, then diagonally oriented Cherry.So far, everything is being done from the glue face. I sawed using a reversed pattern. Assembled it onto shelf paper using the same orientation as sawing, then applied a border. I used blue tape for this step of the assembly. Once the banding was taped to the picture I glued the whole stinking mess down to my kraft-paper-covered pattern board. Patrick and Patrice at the ASFM would probably yell at me for all of the extra steps with shelf paper and blue tape, but I’m not ready to take the training wheels off yet. Tomorrow I’ll fill the gaps with mastic and glue this down to an MDF backer in the correct orientation. I’m on the fence if I’ll leave it at that, or build a small cabinet around it. In the meantime I’m listening to the sounds of glue drying and trying to figure out what to make next. Joe, It’s looking great. I know nothing about marquetry, and I presumed it was demanding and intricate, but it’s really instructive to see some of the specific steps you’re taking. Cool. I love it. The folded petals of the lower flower help create a three dimensional illusion. Yeah, I like that detail. I like the “lushness” of the foliage too. I think it will be “lusher” with finish. THe border was fun, I learned a few tricks for that and my next one will be neater. Joe, Looking good, and always, I admire your fortitude. Grand work. Thanks Jonathan. The Bohemian waxwings you posted recently on your blog are beautiful. Beautiful birds and the composition could be really neat as a marquetry picture. Looks great! How thick is the veneer you are using? Pardon if I missed in a previous post. Hi Chris, this is standard commercial veneer. Which means it’s roughly .020″ thick. (“oh-two-thin”). Some, like the red-dyed veneer is thinner at around .014″. 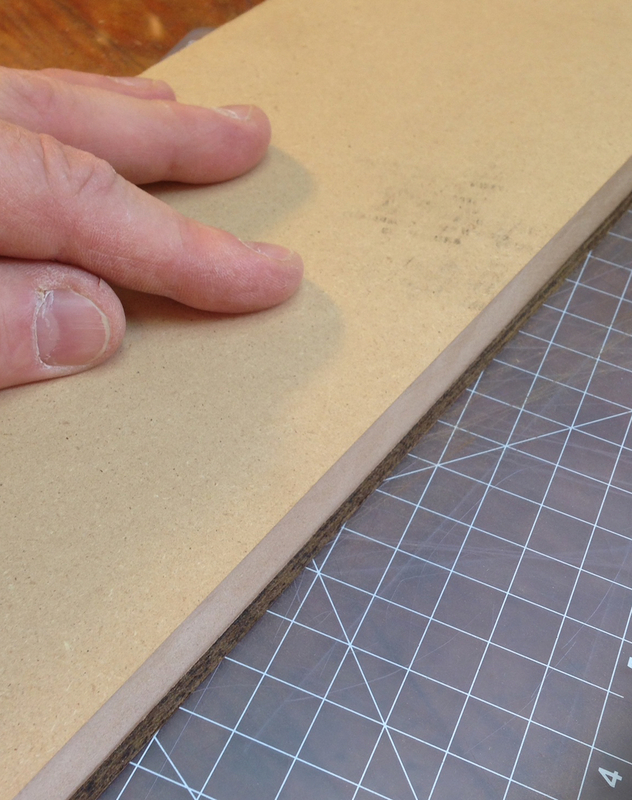 Standard veneer is about the thickness of a business card. A cheap business card. I’ve gotten a couple pieces of veneer that clocked in around .030″ to .040″, that stuff was a dream come true. Yipers, that is thin. I’ve been cutting my own, but was thinking of buying a commercial pack. Might still be worth it for experiments. Looks good and will look forward to seeing what’s under the mastic. Ron’s a pretty amazing craftsman, and not just with metal although of course that’s what he’s best known for. He has some cool wood pieces he’s made, and he’s done a lot of work with acrylics to produce sculpture.